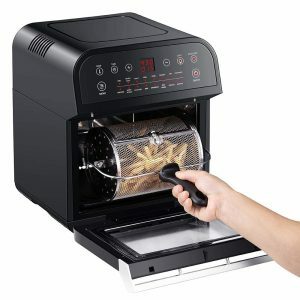 Black GoWISE USA GW44800-O is a 15-in-1 electric air fryer with a large 12.7 quarts capacity and that works as a food dehydrator and a rotisserie. The rating is 4.3 out of 5 stars by 14 customers on the day of this review. You can purchase it in either black or red, which costs twenty dollars more. With a capacity of 12.7 quarts this family size air fryer is actually one of the largest capacity on the market- is much more spacious than it looks on the photos. But it measures 12 x 12 x 14.5 inches- is compact enough on the outside to fit on your counter. On its three racks you can place different items and you shall be in total control of how quickly they’ll be cooked and how crispy it will be. It comes with a total of ten accessories including an oven rack, a drip pan, rotisserie cage, rotisserie steak cage, skewer rotisserie, a rotisserie tong, rotisserie rod, two mesh trays and a shallow mesh basket. The integrated rotisserie lets you cook a whole chicken, kebabs, roasts, and tenderloins. And they will turn out moist on the inside and crispy on the outside. The display panel is easy to read and operate and includes 15 presets with the set times and temperatures. It cooks faster than your conventional oven and uses up less power, so you won’t really need to turn the oven much. It has a stainless steel interior and a detachable non-stick drip pan, and it is all rather easy to clean. You can air fry, bake, roast or rotisserie with the Rapid-Air Technology at the touch of a button in much less time. The maximum for the temperature is 430 degrees according to the manual. It doesn’t get too hot on the outside or down below and you can put it on a granite countertop, but best not to put it too close to the wall. There is no lower cooking element but an inner circulation fan to distribute the heat all over the interior to cook your meals evenly. And you’ll also find a convenient rotisserie for whatever you may want to make. You have a dehydrate option on this air fryer’s display panel and you can easily dehydrate fruits and veggies or make beef jerky. The door is sealed and shuts off very nicely and opens easily. It is a very well made unit and you shouldn’t have any problems. The interior is stainless steel and although you may get a little smell the first time you use it but it will go away pretty much the second time. But in most cases you will never smell anything as there is no plastic inside. 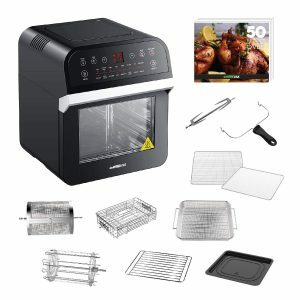 It is a very versatile oven that lets you make lots of different things- mains, sides, desserts, snacks and more. Everything will mostly come out great. You set the time and temperature but it is best to keep an eye on as it cooks much quicker than normal. It acts like a convection oven that distributes the heat evenly. It is very easy to use, your dinner will be ready pretty quickly and is easy to clean once it is done. GoWise has a decent reputation in the country and offers a one year limited warranty for all of their products along with good customer support. You’ll get a bonus book of 50 step-by-step recipes in the box. Overall the 12.7 qt. air fryer seems to be very much worth the money.